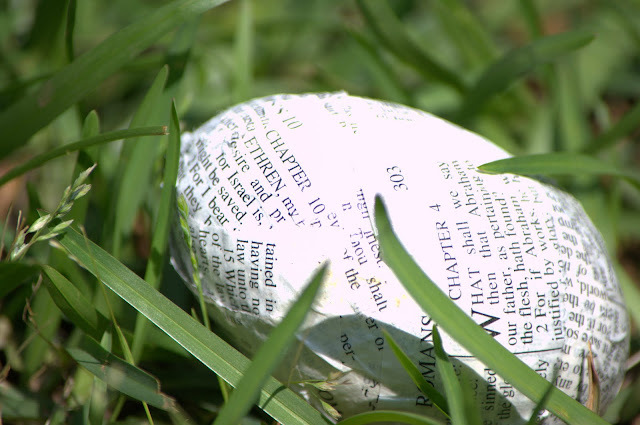 Every Easter for years, we spent time at my grandparents' house where their church put on the best Easter egg hunt. I looked forward to those hunts. The dressing up and hooking my basket, the same one used every year, over my arm. The sea of bright dresses. The frantic runs through Spanish moss-donned oaks and freshly mowed grass. Finding a basket's worth of candy filled plastic eggs. But, there was more. There were always two special eggs. One gold. One silver. Ah, to find the gold! I am all grown up now. Even my oldest children have long passed the age of delight in plastic eggs and candy. Treasure hunting just isn't what it used to be, and I think our lives are a little less colorful for the loss. I've also found that, much to my surprise, recovering the thrill of the hunt is more critical now than ever. You see, life has been tenderizing my heart a bit lately. Wrong responses to right things. Right responses to wrong things. It all pounds away at my toughest parts and leaves me on the brink of tears in its painful wake. All I can see is the mud thrown against my view. It's a mud I wallow in for weeks. Failures. Mistakes. Should haves. Oughts. What ifs and if onlys. I post these words to focus where I need them most. And it hits me today. This isn't a picture of character traits to aspire to or some distant utopian life. It is a portrait of a Savior. When I seek these things in all things, hard or soft, I find Him. I am going on a God hunt. And that, my friends, always ends with possessing a treasure worth more than silver or gold. Beautiful, Beth. What a wonderful "hunt" and what a wonderful view of a "portrait of a Savior". Thank you for helping turn my face toward His.